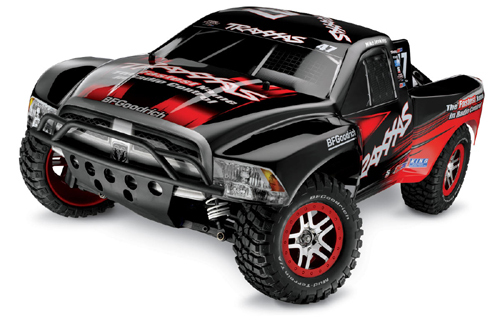 TRA6808L - 1/10 Traxxas Slash 4WD Short-Course RC Truck. The Slash 4x4 is fully assembled, Ready-To-Race with TQi 2.4GHz radio system, Velineon Brushless Power System, Race Replica painted body, 2-Cell 4200mAh (7.4 volts) Traxxas Power Cell Lipo Battery Pack, Lipo Charger and Precision Tool Set. Mike Jenkins Edition. Discontinued Item. Introducing the Slash 4X4. Of course, it's what you would expect from a Slash; tough, fast, fun, and yes, 4-wheel drive! All-new from the ground up, Slash 4X4 is not a conversion or a retrofit-it's a completely and purpose-built for over-the-top speed and performance. Traxxas engineering is behind the innovation that fuels the hobby and Slash 4X4 takes full advantage. The long list of features includes an all-new rigid chassis, new super-efficient shaft drive, new race-bred suspension, new steering system, new licensed BFGoodrich� Mud-Terrain� T/A� tires, Revo� sealed differentials, Velineon� brushless power, and a TQi 2.4GHz radio system. The weight bias? Perfect. The look? Dead on. Top speed? 40+mph with the included 4200mAh 2-cell LiPo battery pack. Power Up� to the Mamba Monster� (it drops right in!) and 80+mph is in your reach. Slash 4X4 keeps all the great features and characteristics that made Slash such a hit with enthusiasts, while at the same time injecting new thinking, new components and track bred performance. MODEL 6808L: Fully assembled, Ready-To-Race, with TQi� 2.4GHz radio system, Velineon Brushless Power System, Power Cell 4200mAh 2-Cell LiPo Battery, LiPo Balance Charger, and Race Replica painted body.